Roomier fit and low garment shrinkage. Soft, 100% combed cotton fabric. 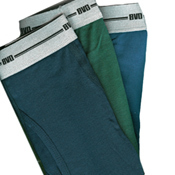 Push-back lycra waistband for comfort and durability. Size 44 does not come in color.